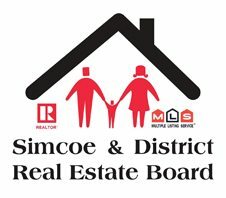 Welcome to the Simcoe and District Real Estate Board (SDREB) web site! We are so happy to make your acquaintance. Our Real Estate Board covers a very diverse and extensive region. Locally there is everything from Carolinian forests to vacant land, farms, cottages, and Lake Front. Predominantly we are a rural region with outcroppings of urban living centers, and just to make it more interesting throw in a splash of commercial and industrial real estate. Your local Simcoe and District Real Estate Board members, are highly trained and knowledgeable about our unique area and all there is to offer. These local REALTORS® can help you with expertise in home sense issues; how does a septic system work, sand points or dug wells, water testing, local zoning by-laws, viability of farm land, building codes and where are the wind mills? Your local REALTOR® has firsthand knowledge regarding what may be your family’s most basic needs and priorities such as where do you find a Doctor, medical offices, hospitals, schools, churches, golf courses and recreational activities. Our knowledge to help you is endless and there for the asking. These local REALTORS® hold in their hands and hearts all the information and knowledge that you need to make your move as “Stress Free” as possible. Your local REALTOR® is waiting to present to you our neighbourhood , the “South Coast” of Lake Erie. So call us, email an inquiry or drop in at one of our Open Houses. The links to us are all here on our web site and at your fingertips. The members of the Simcoe and District Real Estate Board are hoping to hear from you soon!! And Welcome to your new home!